A prodigy kouhai among the Undine students, she regularly practices with Akari and Aika despite technically being lower in 'rank'. Alice shares a room with Athena-senpai, one of the 3 great Undines on Aqua (the new name for Mars after it was terraformed). She respects her yet at the same time can't help but internally sigh at Athena-senpai's dojikko tendencies. Loves to use the adjective "dekkai" which translates to big/large. Normally a somewhat aloof and distant girl, she warms up a little to Akari and Aika. Despite keeping up a serious demeanour most of the time, she is a young girl - thus sometimes plays youthful games (e.g. "walk only on shadows to get home") and gets excited about potential romance stories like any other ordinary teenage girl. Maa, the cat that would eventually become the president of Alice's company (it's a good luck charm among Undine organisations - put a blue eyed cat as president), was at first a stray cat that Alice secretly adopted. 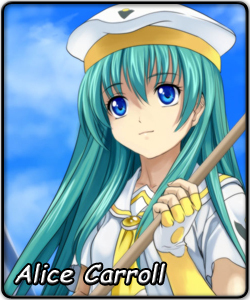 In short, Alice is a girl with a hardened exterior from the pressures of being a prodigy, but has a normal warm core.